As the weather becomes colder , and you tend to spend more of your time indoors, you’re also more likely to catch cold and flu viruses. The cold and flu season can begin as early as May and usually ends sometime in September, but long-lasting sickness isn’t inevitable. 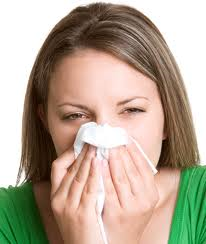 The common cold, also called viral rhinitis, is one of the most common infectious diseases in humans. The infection is usually mild and improves without treatment. Since so many viruses can cause cold symptoms, development of a vaccine for the common cold has not been possible. There is no evidence that going out in cold or rainy weather makes you more likely to catch a cold. The common cold causes a group of symptoms that are easily recognized by patients and doctors. About 50% of patients will develop a sore throat, which is often the first symptom to appear because it can occur as early as 10 hours after infection. This is followed by congestion in the nose and sinuses, a runny nose and sneezing. High fevers are rare with the common cold. The common cold most often is transmitted by direct contact with germs from the nose, mouth, or coughed or sneezed droplets from someone who is infected, usually by hand-to-hand contact. It is possible to become infected by touching a surface, such as a table top or doorknob that was recently touched by an infected person, and then touching your eyes or nose. These viruses also can be spread by inhaling particles from the air after an infected person has coughed or sneezed. If possible, you should avoid close, prolonged exposure to people who have colds. People who exercise regularly, especially those who exercise daily, have fewer colds per year than those who are less active. Although medical therapies can improve the symptoms of the common cold, they do not prevent, cure or shorten the illness. Drink enough fluids, get plenty of rest and treat your symptoms to keep yourself as comfortable as possible. Gargling warm salt water can soothe a sore throat. Inhaling steam may improve nasal congestion temporarily. Over-the-counter cold remedies that contain a decongestant will help to dry secretions and relieve congestion. These remedies may also relieve cough, if the cough is triggered by mucus in the throat. Antihistamines may improve the symptoms of runny nose and watery eyes, but they should be used with care because over-the-counter versions cause sedation. Over-the-counter cough suppressants do not have a proven benefit, but some people feel that they are helpful. It is important to keep in mind that antibiotics do not cure the common cold or shorten the length of time that symptoms last. Vitamin C and Echinacea (a frequently used herbal therapy) have been widely rumoured to decrease the likelihood of developing the common cold and to shorten symptoms, but no conclusive research has shown that this is true. Influenza (the flu), is a respiratory infection. It is caused by the influenza virus. Influenza typically is spread by air or by direct contact from one person to another. Influenza virus is very contagious and peaks during the winter months. Compared with other viruses, influenza can strike remarkably large numbers of people in a relatively short time. In the developed nations, about 10-15% of the people get the flu each year. Flu can cause a variety of symptoms. They can be mild or severe. Symptoms and severity depend on the type of virus, your age and overall health. Dangerous complications also can develop from flu. One of the most feared complications is a bacterial super infection. A super infection occurs when the influenza virus attacks a lung and weakens its defences. This makes the body susceptible to bacterial pneumonia. Options for heading off an attack of influenza have increased in recent years. Vaccination —can reduce your chances of getting the flu and transmitting it to others. Vaccination each year is recommended for all people particularly Children, seniors or those with internal organ disorders. The standard flu vaccine helps healthy people younger than 65 to avoid the disease or lessen its severity. Good hygiene — The virus usually is passed through the air, by coughing. It also is passed by direct contact, such as shaking hands or kissing. Practicing good hygiene can help you to avoid getting the flu or spreading it to others. Good hygiene includes covering your mouth when you cough and washing your hands frequently. Antiviral drugs — Zanamivir (Relenza) and oseltamivir (Tamiflu) can substantially reduce your chance of getting the flu if they are taken just before an expected outbreak. To ease symptoms, your doctor will recommend that you rest and drink plenty of fluids. For fever and body aches, you can take over-the-counter pain relievers. The antiviral drugs zanamivir or oseltamivir , taken within 48 hours of the start of symptoms may speed recovery by about one day. Because flu is a viral infection, antibiotics are not effective. Children who are suspected of having flu, and who have high fevers should be given acetaminophen (Tylenol). They should never be given aspirin to treat the fever. This can cause the disease called Reye’s syndrome. I hope this helps you and your family keep Healthy and Fit this winter. You will often hear many conflicting facts about proteins, carbohydrates and fats, but one area that has not been misunderstood is SUGAR. By now, you should all know the answer to the question, How much sugar am I allowed in one day? There is no recommended daily allowance for sugar. Most of you are probably saying right now, “Sure, no sugar”. I am not saying you cannot have sugar, but there is no such thing as a recommended allowance for sugar. Sugar is a refined product that is made by man and put into many items we eat every day. It doesn’t take a medical genius to surmise that putting so much sugar in our bodies might not be a direct path to a long healthy life. Most experts agree that we all eat far too much of it: rates of obesity have dramatically increased in Australia over the past 20 years, and studies have linked drinking large amounts of sugar-sweetened beverages to increased risk of obesity, especially in children. such as fruits, vegetables and rice are converted into glucose. The body uses glucose for energy and it is metabolised to produce warmth. Unfortunately, many manufacturers have combined all carbohydrates on food labels into one category- whether refined or not. Be aware of a product that has a total of 25 grams of carbohydrates and 20 grams of it are sugar. This product is mostly all sugar and is not a very healthy food choice. (anything in moderation is still a good philosophy). • Lactose- sugar from milk. “Lactose intolerance” – caused by the sugar in the milk. The refined product of sugar cane “sucrose” can be very addictive. The more our body has, the more it wants. If you limit your sugar intake, you will be surprised how you do not crave sugar like you used too. The bottom line is that sugar can be very detrimental to your health. Many people have developed diabetes, cancer and skin problems due to long term overdoses of sugar. Due to many hours lapsing between meals and insulin levels dropping, your body begins to crave the nourishment, and usually sugar or “sucrose” is the outcome. So next time you get a craving for one of the above – remember this article, drink a big glass of water and reach for some fruit or veggies! Optimistic or Pessimistic. Your Choice? My friend was right, I had just been through some tough times and could have chosen to be depressed and angry, but I was still looking forward to each new day and the possibilities ahead of me. While this was normal for me, my friend’s comment made me realise that not everybody felt the way I did. Why was I so optimistic, anyway? Optimism comes from the Latin word optimus, meaning “best,” which describes how an optimistic person is always looking for the best in any situation and expecting good things to happen. Optimism is the tendency to believe, expect or hope that things will turn out well. Even if something bad happens, like the loss of a job, an optimist sees the silver lining. For me, there is always “sunshine after the storm” and I always remind myself that no matter how bad things may seem at the time, there will always be good times afterwards, and very often unforeseen circumstances can force change for the good. The emerging field of positive psychology studies the positive impact that optimism has on mental health. Other research shows that optimism may be good for your physical health too—optimists are sick less and live longer than pessimists. Apparently, a positive outlook on life strengthens the immune system (and the body’s defences against illness), cardiovascular system (optimists have fewer heart attacks), and the body’s ability to handle stress. Being an optimist or a pessimist boils down to the way you talk to yourself. Optimists believe that their own actions result in positive things happening, that they are responsible for their own happiness, and that they can expect more good things to happen in the future. Optimists don’t blame themselves when bad things happen. Pessimists think the opposite way, however. They blame themselves for the bad things that happen in their lives and think that one mistake means more will inevitably come. Pessimists see positive events as flukes that are outside of their control—a lucky streak that probably won’t happen again. Because of their thought processes, optimists have much brighter futures. A bad circumstance or event is taken in stride, viewed as a temporary setback—not a permanent way of life (don’t cry over spilt milk). Even if something bad happens today, a positive thinker believes that good things will come again in the future. They think about, reflect on, and emphasise the good things in life. They are grateful and thankful for all their blessings. They don’t complain when something bad happens. They feel that nothing can hold them back from achieving success and reaching their goals. They are confident that the world offers plenty of opportunities for everyone to succeed. Luckily, you can change your thinking patterns over time. Even a pessimist can become an optimist with enough practice! All you need to do is to reframe how you define events. Instead of dwelling on the bad experience, analyse it to figure out what good can come of it. Even if a project at work is deemed a failure, think about what you learned during the process. What strengths did you discover within yourself, and when can you use those talents again? Instead of blaming yourself for the failure, think about the outside influences that may have affected your project. Maybe you were delayed by outside vendors, so you couldn’t meet a deadline; or management decided to go in another direction, making your project redundant. Virtually any failure can be turned into a learning experience, which increases your potential for success in the future. Optimism is a skill of emotional intelligence, which translates to a better career and greater success in life. Life is too short to be miserable, so start turning your thinking around! Positive thoughts, an optimistic outlook, and overall happiness can advance your prospects for work, relationships and other life experiences. I have listed 10 lifestyle changes below, that you can make to lower your blood pressure and keep it down. Blood pressure often increases as weight increases. Losing just 4.5 kgs can help reduce your blood pressure. In general, the more weight you lose, the lower your blood pressure. Losing weight also makes any blood pressure medications you’re taking more effective. You and your doctor can determine your target weight and the best way to achieve it. Men are at risk if their waist measurement is greater than 102 cm. Women are at risk if their waist measurement is greater than 89 cm. Regular physical activity — at least 30 to 60 minutes most days of the week — can lower your blood pressure by 4 to 9 millimeters of mercury (mm Hg). And it doesn’t take long to see a difference. If you haven’t been active, increasing your exercise level can lower your blood pressure within just a few weeks. If you have prehypertension — systolic pressure between 120 and 139 or diastolic pressure between 80 and 89 — exercise can help you avoid developing full-blown hypertension. If you already have hypertension, regular physical activity can bring your blood pressure down to safer levels. If you haven’t already been exercising regularly, avoid being a “weekend warrior.” Trying to squeeze all your exercise in on the weekends to make up for weekday inactivity isn’t a good strategy as those sudden bursts of activity could actually be risky. Eating a diet that is rich in whole grains, fruits, vegetables and low-fat dairy products and skimps on saturated fat and cholesterol can lower your blood pressure by up to 14 mm Hg. Consider boosting potassium. Potassium can lessen the effects of sodium on blood pressure. The best source of potassium is foods, such as fruits and vegetables, rather than supplements. Be a smart shopper. Make a shopping list before heading to the supermarket to avoid picking up junk food. Read food labels when you shop and stick to your healthy-eating plan when you’re dining out, too. A lower sodium level — 1,500 mg a day or less — is appropriate for people 51 years of age or older, and individuals of any age who have high blood pressure, diabetes or chronic kidney disease. Don’t add salt. Just 1 level teaspoon of salt has 2,300 mg of sodium. Use herbs or spices, rather than salt, to add more flavour to your foods. Alcohol can be both good and bad for your health. In small amounts, it can potentially lower your blood pressure by 2 to 4 mm Hg. But that protective effect is lost if you drink too much alcohol — generally more than one drink a day for women and men older than age 65, or more than two a day for men age 65 and younger. Also, if you don’t normally drink alcohol, you shouldn’t start drinking as a way to lower your blood pressure. There’s more potential harm than benefit to drinking alcohol. If you drink more than moderate amounts of it, alcohol can actually raise blood pressure by several points. It can also reduce the effectiveness of high blood pressure medications. Track your drinking patterns. Along with your food diary, keep an alcohol diary to track your true drinking patterns. One drink equals 12 ounces (355 mL) of beer, 5 ounces of wine (148 mL) or 1.5 ounces of 80-proof liquor (45 mL). If you’re drinking more than the suggested amounts, cut back. Consider tapering off. If you’re a heavy drinker, suddenly eliminating all alcohol can actually trigger severe high blood pressure for several days. So when you stop drinking, do it with the supervision of your doctor or taper off slowly, over one to two weeks. Don’t binge. Binge drinking — having four or more drinks in a row — can cause large and sudden increases in blood pressure, in addition to other health problems. On top of all the other dangers of smoking, the nicotine in tobacco products can raise your blood pressure by 10 mm Hg or more for up to an hour after you smoke. Smoking throughout the day means your blood pressure may remain constantly high. You should also avoid second hand smoke. Inhaling smoke from others also puts you at risk of health problems, including high blood pressure and heart disease. The role caffeine plays in blood pressure is still debatable. Drinking caffeinated beverages can temporarily cause a spike in your blood pressure, but it’s unclear whether the effect is temporary or long lasting. To see if caffeine raises your blood pressure, check your pressure within 30 minutes of drinking a cup of coffee or another caffeinated beverage you regularly drink. If your blood pressure increases by five to 10 points, you may be sensitive to the blood pressure raising effects of caffeine. Stress or anxiety can temporarily increase blood pressure. Take some time to think about what causes you to feel stressed, such as work, family, finances or illness. Once you know what’s causing your stress, consider how you can eliminate or reduce stress. If you can’t eliminate all of your stressors, you can at least cope with them in a healthier way. Take breaks for deep-breathing exercises. Get a massage or take up yoga or meditation. If self-help doesn’t work, seek out a professional for counselling. 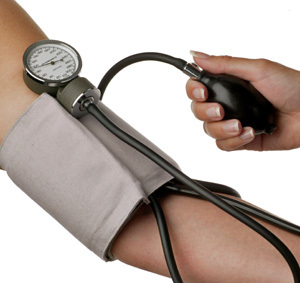 If you have high blood pressure, you may need to monitor your blood pressure at home. Learning to self-monitor your blood pressure with an upper arm monitor can help motivate you. Talk to your doctor about home monitoring before getting started. Regular visits to your doctor are also likely to become a part of your normal routine. These visits will help keep tabs on your blood pressure. Visit your doctor regularly. If your blood pressure isn’t well controlled, or if you have other medical problems, you might need to visit your doctor every month to review your treatment and make adjustments. If your blood pressure is under control, you might need to visit your doctor only every six to 12 months, depending on other conditions you might have. Supportive family and friends can help improve your health. They may encourage you to take care of yourself and join an exercise program with you to keep your blood pressure low. If you find you need support beyond your family and friends, I’d gladly talk you through your options and share my knowledge to help you, be the best you can be. Please fill in the form below, to organise a time that suits you. Dirk Hansen has been a Health & Wellness Professional, Presenter and Writer for over 35 years, featuring both in Australia and the USA. You can learn more about DirksHealth and what we do by calling 9365 7033 or by posting a comment above. “What exactly is High Blood pressure” I here you say, today I want to explain what High Blood Pressure actually is. Your Blood pressure is the force of blood pushing against your blood vessel walls. Each time it pumps, your heart pumps blood into your arteries (blood vessels), which then carry the blood throughout your body. High blood pressure also called hypertension, means that your blood is pumping with more force than normal through your arteries and this is dangerous because it makes your heart work harder than it needs to and it contributes to the hardening of the arteries and the development of heart failure. An Australia Heart Foundation Survey completed in 2014/15 found that 6 million Australian aged 18 years and over had been told by a doctor that they have high blood pressure. That’s 34% of Australian Adults, and those are the ones that have been diagnosed and unfortunately many more are never diagnosed, and hence the increasing number of Heart Attacks and Strokes. What Is “Normal” Blood Pressure? Your blood pressure will go up and down throughout the day, and one higher reading does not indicate High Blood Pressure, but if you get a high reading you should be sure to check it again within 48hrs, and another high reading should prompt an appointment with your GP. And the big one — stress! Unfortunately for far too many people, blood pressure usually causes no symptoms which is why High Blood Pressure often is labeled “the silent killer.” People who have high blood pressure typically don’t know it until their blood pressure is measured or the have a heart attack or stroke!! Eye damage with progressive vision loss. Peripheral arterial disease causing leg pain with walking. Weight: As body weight increases, the blood pressure rises. Not only the amount of weight is important, but also the manner in which the body accumulates extra fat. People who carry weight around their stomach have far greater health risks for high blood pressure than “pear-shaped” people. Sodium (salt) sensitivity: Some people have high sensitivity to sodium (salt), and their blood pressure increases if they use salt. Reducing sodium intake tends to lower their blood pressure. Australians consume 10-15 times more sodium than they need. Fast foods and processed foods contain particularly high amounts of sodium. Alcohol use: Drinking more than one to two drinks of alcohol per day tends to raise blood pressure. Lack of exercise (physical inactivity): A sedentary lifestyle (sitting at a desk all day) contributes to the development of obesity and high blood pressure. Medications: Certain drugs, such as amphetamines (stimulants), diet pills, and some medications used for cold and allergy symptoms such as pseudoephedrine, tend to raise blood pressure. The big thing to take away from today’s blog, is that the largest cause of death in Australia is totally preventable. If you want to take a step in the right direction please fill in the box below with any questions. I often laugh when I recall a dinner party (Sunday Roast) I held for a number of my friends and their partners many years ago when I was single. in my early twenties. I had prepared Roast Lamb with Veggies and Gravy and had an Apple Pie in the oven, a few beers and a good bottle of REd. Everything was going to plan until someone asked for the salt? Now I had never kept salt in the house and never added it to any of my food (still don’t), so I was quite surprised by the UPROAR from all those attending when I told them there wasn’t any in the house and they would have to eat their meal without adding salt. Almost thirty years later salt (Sodium) is still a concern when it comes to nutrition and health. There is a lot of misinformation floating around when it comes to what salt’s nutritional purpose is and how much of it we should consume, so today I want to clear that up. Dietary salt is essential for all animal life in small quantities, yet consuming too much salt as most of us do, can increase the risk of contracting an array of health issues including but not limited to stroke, heart disease, hypertension (high blood pressure), osteoporosis and heartburn. Diets high in salt increase blood pressure, a leading risk factor for Cardiovascular disease. The average Australians intake is two and a half times the recommended amount. Cardiovascular Disease kills one Australian nearly every 10 minutes. Affects more than 3.4 million Australians. Prevents 1.4 million people from living a full life because of disability caused by the disease. Affects one in five Australians, and affects two out of three families. Claims the lives of almost 50,000 Australians (35% of all deaths) – deaths that are largely preventable. 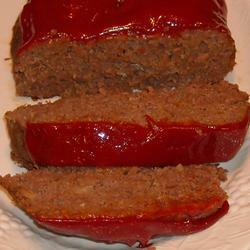 Buy fresh, plain frozen, or canned “with no salt added” vegetables. Cook rice, pasta, and hot cereals without salt. Cut back on instant or flavored rice, pasta, and cereal mixes, which usually have added salt. Choose “convenience” foods that are lower in sodium. Cut back on frozen dinners, pizza, packaged mixes, canned soups or broths, and salad dressings — these often have a lot of sodium. A recent study by Brigham and Women’s Hospital and Harvard Medical School, confirms that people who reduced their salt intake by 25-30% had an equal reduction in risk of cardiovascular disease of 25-30%. So if you think you fall into the category of consuming too much salt, set yourself a goal of reducing your salt intake (and risk of cardiovascular disease) by 30% over the coming weeks. Which Salt is good for you? Refined salt is the main reason salt has such a bad reputation. It’s the same terrible stuff you find in processed foods. Our bodies actually need salt, but most research has revolved around refined table salt – and the results have shown that this stuff is not good for you. In many parts of the world, it is well-accepted that salt itself is NOT the problem … it’s the kind of salt that’s causing problems. Refined table salt is pretty scary, actually. It often contains harmful anti-caking agents, some of which have been linked to heavy metal toxicity and kidney problems. A common preservative in these refined salts, sodium acetate, may cause elevated blood pressure and kidney disturbances. The truth is that unrefined sea salt is actually good for you. It helps to balance your blood sugar, helps keep your bones strong, regulates your metabolism, boosts your immune system and more. Natural, unrefined sea salt provides a number of nutrients and minerals, in a way that the body recognises and knows how to use, so look for this on the shelf the next time you are shopping. Eating correctly is the first step to giving your child every opportunty to perform at their best (concentrate), during school hours. Healthy lunches and snacks are important for children and help with concentration and learning. Healthy eating changes are not always easy to make, so try to set a good example with your own lunches. Encourage your child to be involved in their own lunch preparation, and their choices about foods to include. Praise your child when they choose healthy foods for the lunch box. There are limited times for children to eat during the day, especially at school. Children may prefer to play with friends instead of eating. Encourage your child to sit and eat before heading out to play, or talk to your school about making sure all children get a chance to eat enough before play starts. Food suggestions There are endless food choices available for lunch boxes. It can sometimes be difficult to decide which foods are healthy choices. Vegetables Best choices Try vegetable sticks with dips, or a small container with mixed vegetables such as cherry tomatoes, carrot sticks, celery, corn, beetroot, sprouts, capsicum, snow peas or cucumbers. Foods best left out Chips are best left for parties. Fruit Best choices Fresh, or tinned fruit in natural juice, are everyday foods. Dried fruit is sticky and high in sugar, so eat occasionally or as part of a meal. Foods best left out Dried fruit and muesli bars and ‘straps’ are very high in sugar, low in fibre and stick to children’s teeth causing tooth decay. Reduced fat cheese slices or cubes. Yoghurt – natural or fruit yoghurt. Try freezing a tub of yoghurt and putting it in your child’s lunch box. By lunchtime it will have partially thawed and be ready to eat. Foods best left out ‘Dairy desserts’ and flavoured milks are high in sugar. Sandwiches Include a variety of bread and fillings, especially if children begin to lose interest in sandwiches. Salmon or tuna in springwater. Try mini cans of tuna with added flavours. Grated carrot, lettuce or tomato. Rice – when making fried rice, minimise oil and add lots of steamed vegetables. Foods best left out Avoid chocolate spreads, jam and honey. Avoid fatty meats such as salami and Strasbourg. Biscuits and dips Best choices Wholemeal or multigrain dry biscuits, crispbreads, or rice cakes with yoghurt, hummus or vegetable dips. Foods best left out ‘Oven baked’ and plain savoury biscuits are as high in salt and fat as chips. Muffins and cakes Try making your own healthy muffins and cakes. Include fruit and vegetables such as sultanas, carrot, zucchini, banana and pumpkin. Foods best left out Only offer donuts and cakes occasionally instead of in the lunch box. Muesli and ‘breakfast’ bars Almost all ‘bars’ are too high in sugar. Some high fibre cereal bars are better than chewy, high fat muesli type bars. Try to avoid chocolate bars and muesli bars in lunch boxes. These are expensive and stuck together with fats and sugar. Best drinks Water and milk are the best drinks for children. They can be frozen to help keep foods in the lunch box cool. 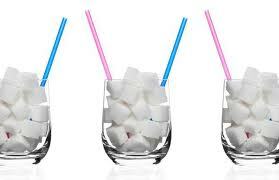 All sweet drinks such as fruit juice, juice drinks, cordials, sports drinks, energy drinks, flavoured milk, flavoured mineral waters and soft drinks are high in sugar and are not necessary. These drinks can increase the risk of tooth decay, are ‘filling’ and may take the place of healthier foods. Tips for busy families Foods should be simple and easy to prepare, ‘ready to eat’ and appetising after several hours of storage in the lunch box. 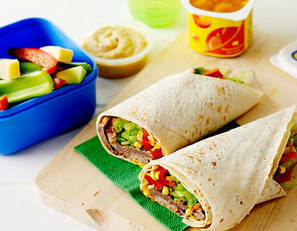 Foods such as sandwiches can be prepared the night before or on the weekend, frozen then taken for each day’s lunch box. Suitable foods to freeze are: bread, cooked meat, cheese, baked beans or vegemite. Food safety In most cases food is stored in your child’s lunch box for several hours, so the lunch box needs to be kept cool. Perishable foods such as dairy products, eggs and sliced meats should be kept cool, and eaten within about four hours of preparation. Don’t pack these foods if just cooked. First cool in the refrigerator overnight. If you include left over meals such as meats, pasta and rice dishes, ensure you pack a frozen ice block into the lunch box. P.S. Our KidsFit classes have started again for the new school term, and are he perfect way to ensure your child is prepared both mentally and physically for the year ahead. Dirk Hansen has been a health & wellness professional and writer for DirksHealth for over 30 years. 1. Assemble spring mix in a serving bowl. 2. Add olive oil and vinegar with the salad. Mix well. 3. Cut up tomato, cucumber, red onion, and strawberries. As you wake up to day 3 of the Fast Track Program, your body is already starting to move into ”Ketosis” . When your body is in ketosis you feel less hungry, and you will eat less than you otherwise do. Your body is now switching from being a carbohydrate-burning organism into a fat-burning one. The fat stores become a primary energy source, and the result is increased weight loss. After speaking to most of you over the past 48hrs, it would seem you all have a pretty good grasp of your Meal Plans (todays is the same as days 1&2) , so today I wanted to go over the 8 main Fat Los Tips, because the closer you follow these tips, the better your results will be. Remember, this is “Fast Track” fat loss and even if you do sacrifice a little bit of muscle using this strategy, it’s well worth the tradeoff because you’ll simply burn a lot more fat. So my advice for you to look the best you can look in 10 days? AFTER a meal before training. This metabolic trick will do two things. It will boost fat burning hormones like HGH and adrenaline levels and it will give your body no choice, but to use fat for fuel (since you have very little “food energy” in your system). Remember, you might not have as much energy as if you were training in a fed state, but you’ll achieve the goal of burning fat at a much faster rate. You’ll notice that this entire plan’s schedule is specifically set up to easily accommodate fasted exercise through “intermittent fasting” techniques. Make sure you wait at least 30, but no more than 60 minutes after exercise before eating any food or consuming any calories. Although eating directly after a workout is a healthy choice, it’s not the best choice for emergency fat loss. Immediately feeding your muscles and your body after workouts will definitely burn up and store the food and calories at a much faster rate because of insulin levels and sensitive. And if our goal were to gain muscle or we weren’t in a huge hurry to aggressively burn fat, this would be the perfect option. This plan is about emergency fat loss, so we want to take advantage of ANY and EVERY opportunity to trick our body into burning more fat. And the minute you put food or calories in your system you’ve just instructed your body to stop burning fat and start burning food instead. If your exercise intensity is high enough (which it should be), you’ll force your body to release all kinds of fat burning hormones, so we want to maximise this metabolic environment. However, the minute you eat food, you’ll spike your body’s primary storage hormone – insulin, and although insulin helps shuttle nutrients to muscles quickly, it could potentially blunt or block your growth hormone and other hormones from working their magic. Simply put, insulin is the “antagonist” of growth hormone and possibly other hormones. Every time you eat or consume calories, you raise insulin. In theory, these fight or flight hormones will also spare muscle and help you burn a lot more fat while you ride the fat burning wave during this post workout window. Ultimately, when it comes to aggressive fat loss, the solution is to get the best of both worlds by fasting for about 30 to 45 minutes after your workout and then consuming a post workout shake or meal so that your body can still take advantage of the post workout “metabolic window” to absorb nutrients at a much faster rate. This is a metabolic trick. Use it as much as possible during these 10 days. Even for MRT workouts. Even though you’ll be limiting starches, make sure to consume them within one to three hours after your MRT or HIIT workouts. This will ensure they’re used to replenish glycogen and guarantee practically no fat spillover. Aggressive exercise and slightly over-training for short periods of time (like 10 days) can be super effective for fat loss. You really want to push the limits and get your body to do things it normally wouldn’t do during this 10 day period. You shouldn’t have to worry about going over 5 or 6 hours of total exercise for the week, but make sure you get to as many classes as possible to maximize your results. 6. Double your water intake. If you’re retaining water you’ll weigh more on the scale and it will make your skin look loose and your face look puffy. Remember, the more water you give your body, the less it will hold onto. It’s extremely important during this period of time to take in as much water as possible. Aim for 4L a day. We’ll be cutting your water intake down dramatically the day before your deadline, but until then drink a ton of water. It’s not mandatory, but it really helps to supplement heavily during this time. This is a time when supplements become necessary and can definitely give you the extra edge. First, make really good use of whey protein shakes and meal replacements for on-the-go, low calorie meals. Second, you’re putting your body through a little more stress than normal, so it’s important to supplement with vitamins and omegas during this time. Also, amino acids will be crucial to help you preserve muscle and prevent hunger pangs because you’ll be incorporating intermittent fasting techniques. If you want emergency type of results, you’re going to have to do a few things you typically wouldn’t do and make some sacrifices. Counting calories isn’t mandatory but it’s highly recommended. The more clean, whole, natural foods you eat during this 10 days, the better your results will be. Think like the Paleo diet without the starches and fruits. Avoid processed foods. Small dinner salad with 1 tablespoon each of olive oil and vinegar dressing. 1. Season salmon and grill for 5-10 min. until desired doneness. 2. In a large mixing bowl, combine meat, onion, egg whites, salsa, oats, soup mix and black pepper. 3. Form into a pan and spread tomato sauce over top. 4. Bake in oven for 60 minutes. 5. 1 Cup of cabbage, beans and mushrooms .